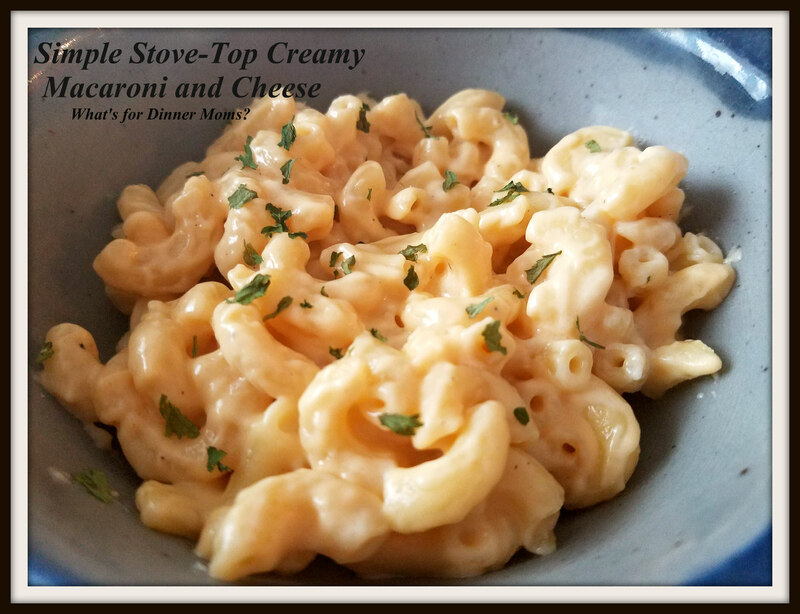 Simple Stove-top Homemade Creamy Macaroni and Cheese – What's for Dinner Moms? My kids love Southern style macaroni and cheese (baked) but it takes so long to bake that it is really not practical to make for a quick-lunch. This version is done in less than 20 minutes start to finish. Perfect for a nice family lunch on the weekend or make a batch and heat it up the next day or two for yourself. This recipe contains EVAPORATED milk. This is different from SWEETENED condensed milk. Evaporated milk is milk that has about 60% of the water removed. Sweetened condensed milk has sugar added. Sometimes these get confused and you want to make sure you get the right one. This was a great weekend lunch for us. Everyone was happy to have a warm, comforting dish on the chilly afternoon. The pinch of nutmeg adds a great flavor if you have never tried it. It was creamy and flavorful. If you like extra-sharp cheddar cheese I highly recommend using it in this. It adds a bit of tang to the dish. Bring water to a boil for pasta. Make pasta according to package directions. As water begins to boil for pasta melt butter in a saucepan. Sprinkle the flour over the butter and stir for 1-2 minutes until a thick paste forms. Slowly add milk to the pan. Whisk until mixture thickens in about 5-7 minutes under a slow simmer. Remove pan from heat. Pour sauce over hot pasta (once it has been drained). Mix sauce, pasta, cheese, salt, pepper, and nutmeg together. Taste and adjust spices as necessary. Serve warm. This looks so good! I have never added nutmeg to macoroni and cheese before. Can’t wait to try it out! I first had it at the German pavilion in Epcot. I asked them what the spice was and they told me it is a traditional spice in macaroni and cheese in Germany. I never knew that! That looks delicious and so creamy. I’m sure it tastes scrumptious! I love creamy Mac & Cheese… Yum!! A macaroni cheese recipe with evaporated milk in it is novel, Marci. I haven’t used evaporated milk in years! My Mom ALWAYS used it as she hated the taste of whole milk. The addition of nutmeg sounds interesting. I have had lasagna with nutmeg and cinnamon added so this probably would be about the same! Thank you! For me it was a grandma thing.